With their 86-76 victory over the Dallas Wings, the Washington Mystics punched their ticket to the second round of playoffs and will be squaring off against the New York Liberty at Madison Square Garden on Sunday night (5 PM ET, ESPN2). 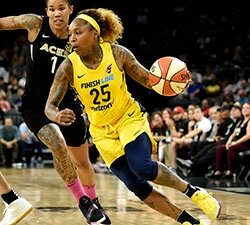 With the stakes ever so high as the second round of the WNBA playoffs is also single-elimination, here’s a look into potential X-factors that can come up big under the bright lights of New York City. Washington forward Emma Meesseman came up big early on Wednesday night against Dallas, scoring eight of her 16 points in the first quarter, leading to a big double-double (10 rebounds) in the winning effort.
.@EmmaMeesseman scored 8 PTS in Q1 to pace the @WashMystics in their single-elimination #WNBAPlayoffs matchup! The performance was Meesseman’s second ever playoff double-double, her first one having come against Sunday’s opponent, the Liberty, back on September 18, 2015. Meesseman had a strong performance in that series, averaging 9.0 PPG, 6.7 RPG and 1.3 BPG. Now, in the second incarnation of the current playoff format, Meesseman has an opportunity to advance into the semi-final round for the first time in her career, having come up short previously in each of her last three tries under the old format (2013-2015). This season, despite missing 11 games due to international duty, Meesseman followed up her breakout 2016 campaign by averaging a second-best 14.1 PPG as well as establishing a new career high with 1.5 BPG. In two meetings against the Liberty this season, Meesseman averaged 15.5 PPG on 12-of-23 (52.2%) shooting. 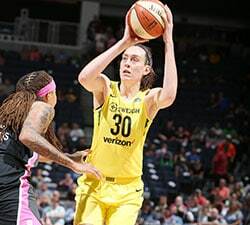 On Wednesday, Meesseman asserted herself as a crucial complement to Elena Delle Donne in their first playoff game together, as the pair combined for 41 of the Mystics’ 86 points. As long as this duo can pace the scoring for the Mystics, the Liberty will have a tall task ahead of them. The New York Liberty come into the second round of the WNBA Playoffs red hot, having ended their 2017 regular season on a 10-game winning streak. One player that had to do a lot with that streak was Shavonte Zellous. During this stretch, Zellous has put up big numbers, averaging 11.7 PPG and 1.3 SPG, including four games of scoring 16 or more points. Zellous had a big game when New York faced Washington back on August 26, scoring 18 points to go along with five rebounds and two assists. In three games against the Mystics this season, she has averaged 15.3 PPG and 5.3 RPG. In this second round matchup, Zellous will bring a ton of playoff experience to the table for the Liberty. 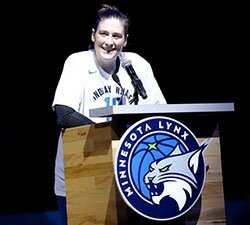 Perhaps Zellous will look to re-kindle her old 2009 playoff self, when she averaged 15.6 PPG (including marks of 19, 21 and 23 points) for the Detroit Shock. 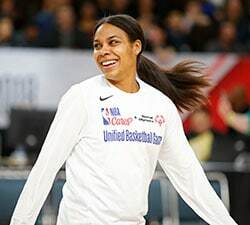 Or maybe she’ll mirror her 2012 WNBA Finals Game 3 self when she went 10-for-17 with three three-pointers to finish the night with 30 points to put the Indiana Fever a win away from capturing their first WNBA crown (which they clinched in Game 4). Back to Sunday, the Liberty ultimately hold the edge in the season series, 2-1, but if Zellous can catch fire at the right time, the Liberty could find themselves playing deep into September. New York is 9-3 this season when Zellous scores 16 points or higher.